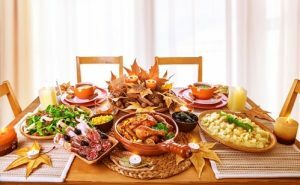 Every Thanksgiving, conscientious eaters worry about foods that they should avoid. They may pass on the butter, opt for white meat or skip dessert altogether. However, healthy eating isn’t just about knowing what to skip. It’s also about picking out the things that are actually good for you. Given the variety of foods brought to the Thanksgiving table, it’ll be easy to focus on one positive aspect of dinner: antioxidants. Antioxidants are compounds in food that help the body neutralize free radicals, which are substances that damage the integrity of DNA and cells. Free radicals can come from environmental pollution, radiation, cigarette smoke, excess alcohol consumption and other sources. The body also generates free radicals during the process through which food is metabolized into energy. Over time, free radical damage increases the risk of cancer, heart disease, Alzheimer’s disease, dementia, Parkinson’s disease and other chronic diseases. However, adequate consumption of antioxidants may help prevent these effects. Turkey may be the highlight of Thanksgiving, but it’d be a mistake to neglect the cornucopia of colorful foods. In fact, half of your plate should be taken up by vegetables such as carrots, broccoli, spinach, squash and tomatoes. If there aren’t enough vegetables on the menu, go for the fruit, like apples, pears and especially cranberries. If possible, opt for fresh cranberries, which can be beneficial to cardiovascular health. Research has shown that bread crust is actually healthier and more packed with antioxidants than the rest of the bread, so when making stuffing, be sure to include the crust and choose whole grain breads, which are much more nutritious than processed grains. However, remember to watch your portion sizes. Only about one-quarter of a plate should be filled with starches, including stuffing and sweet potatoes. There are a number of herbs and spices that are rich in antioxidants, including cinnamon, black pepper, cloves, garlic powder, paprika, turmeric, rosemary and oregano. An even healthier approach is to use some of these herbs and spices as salt replacements to help curb your sodium intake. Scientists continue to explore a number of substances found in red wine and green tea that can potentially fight cancer and heart disease. However, some studies suggest that hot cocoa has more antioxidants than either of these beverages. Coffee is also a good source of antioxidants that may help lower the risk of colon cancer. As always, moderation is key, and skip the cream and sugar. Pumpkin is full of beta-carotene and other antioxidants and nutrients. It’s OK to have some pumpkin pie, but remember not to overindulge. For a healthier option, make your pie with fresh pumpkin and avoid ingredients like condensed milk, which contains a high level of sugar and saturated fat. As long as you watch your portion sizes and monitor your use of salt, fat and sugar, there’s no reason to feel guilty over your Thanksgiving meal. When you include fruits and vegetables, you’ll also help ensure that you’ll be healthy enough to enjoy Thanksgiving parties for years to come. To learn how you can create a nutrition plan that allows you to eat healthy all year long, click here.